Camellias are so beautiful and last week in Southern California the Camellias came into bloom. Yeah! We have lots of camellias, but camellias don't look like much on the bush until they are cut and put into a bouquet, then their ruffly petals overwhelm every other flower, including the rose. 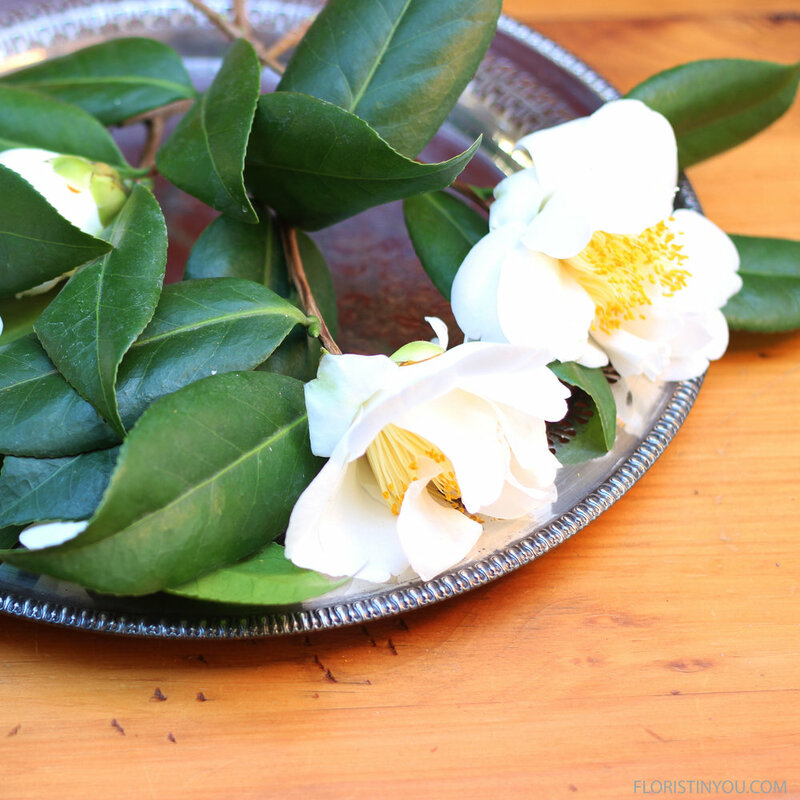 If you can find a place in your yard, I highly recommend planting several camellia bushes. Ours bloom. I have two types of red camellias blooming, and this gorgeous white camellia with yellow fringe that looks like silk tassels. Jasmine Vine grows here all year, as well as Pine, and the Privet Berries are starting to turn dark blue. 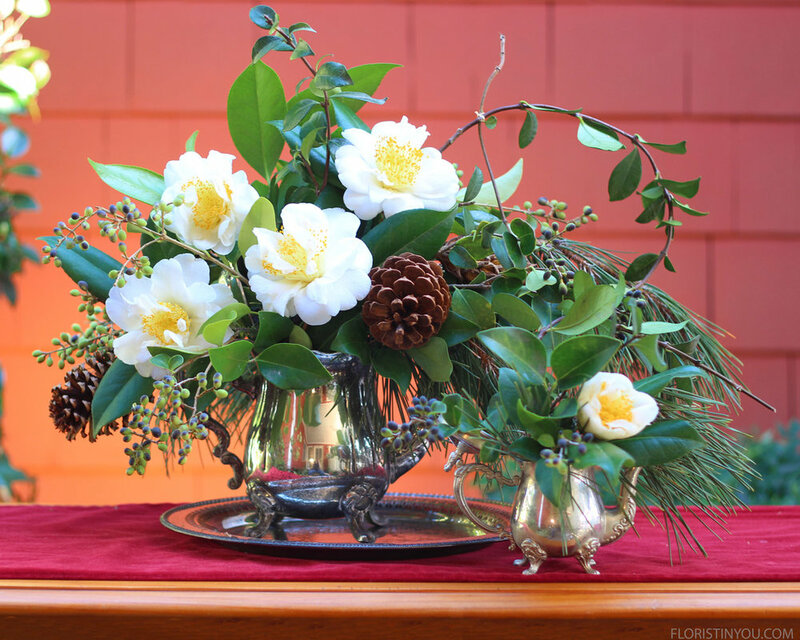 So, it is the perfect time of year to take cuttings from the yard to make a Christmas arrangement. It's great not having to buy flowers from the store. I paired them with silver. The teapot in this arrangement came from a thrift store and the tiny one that you will see in some of the photos is the one my children used for tea parties when they were little. I have always kept it. 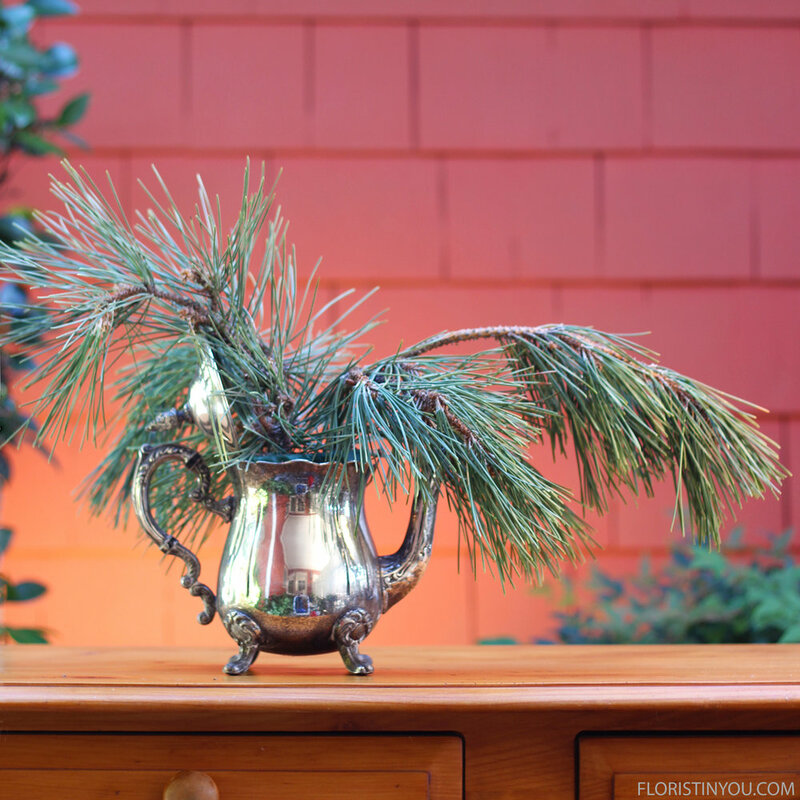 This arrangement is easy, so if you have you pruning shears, make your cuttings and let's begin. 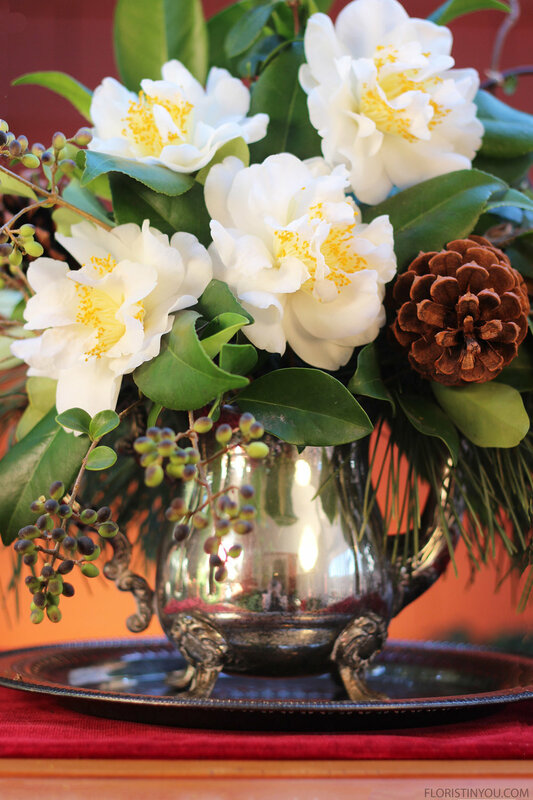 This arrangement will get you in the mood for Christmas. P.S. 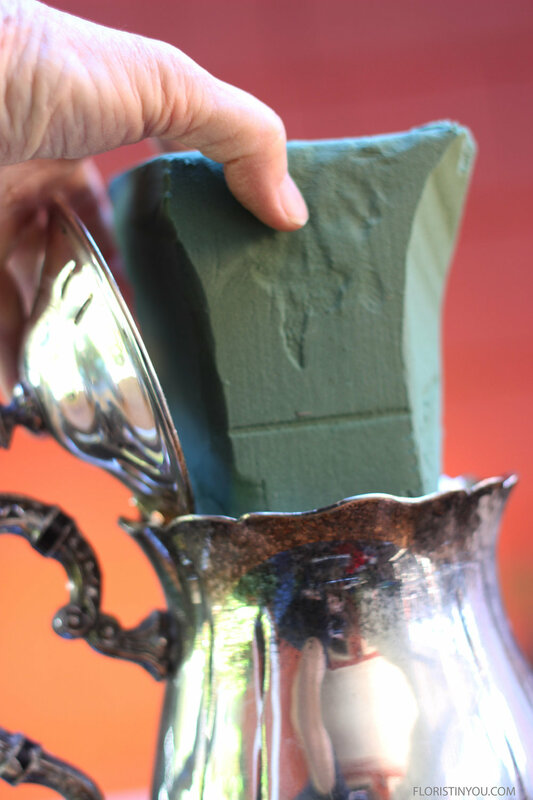 Keep a pat of butter handy to get the pine gum off your fingers. I learned that as a child, gathering pine nuts with my family. Here are your cuttings, material and tools. 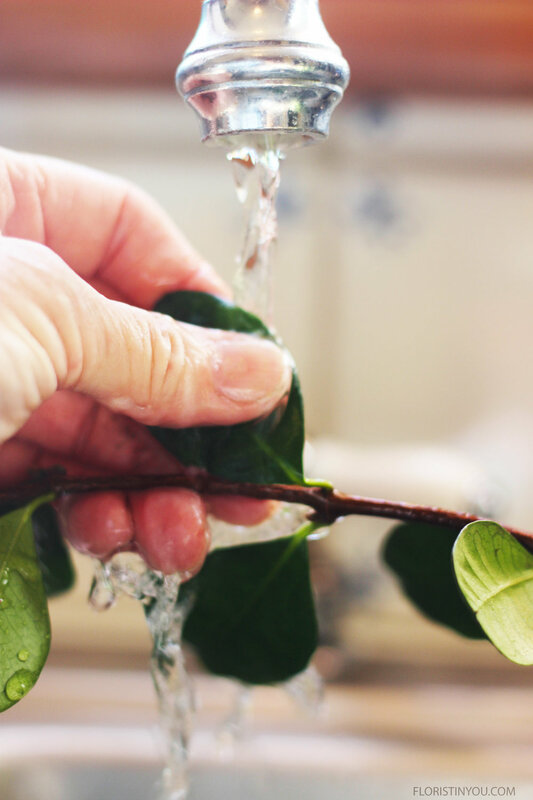 Wash & leaves Jasmine & Privet Berry leaves. Wash & dry Camellia leaves. Don't get the blooms wet. Cut and shape 2/3 of floral brick with produce knife. 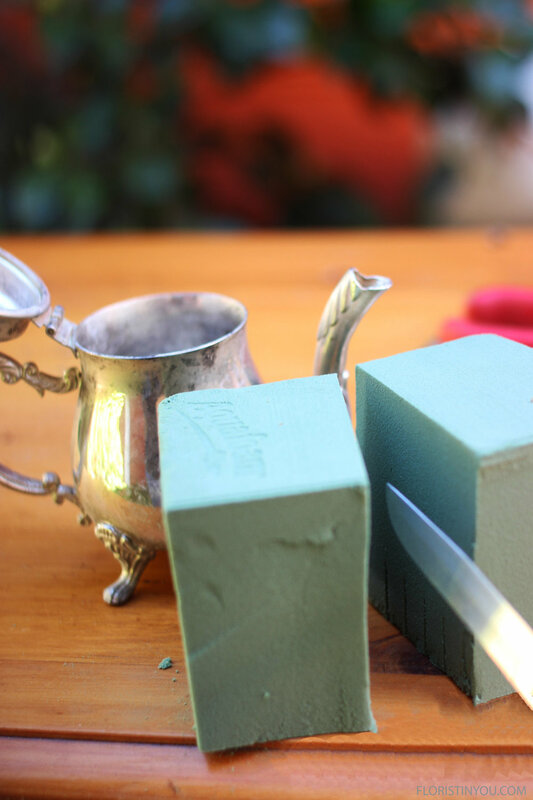 Cut last 1/3 of brick in half and shape for tiny tea pot. Mix floral food in water. Add to foam until it won't accept any more. Repeat for tiny tea pot. Insert pine bowl with longest on right, 1 in back , 1 to the side. Make a loop with end of Jasmine. Tie 2 knots with raffia. Trim close. Insert Jasmine at a 45% angle going out to the right. 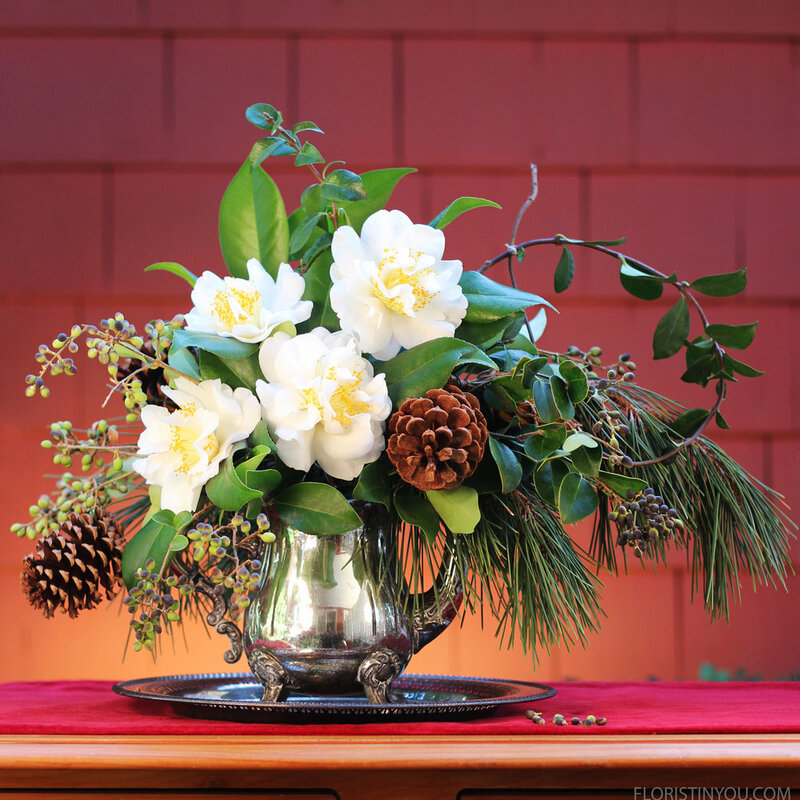 Add 3 Camellias on a 45% angle with 1 above in front. Loop wire around the bottom of Cones. Pulling to inside & twist. Bend wire up 3 inches to hold the weight of the Pine Cone. Put 1 Cone on left on 45% angle, 1 on right, 1 Magnolia Pod. 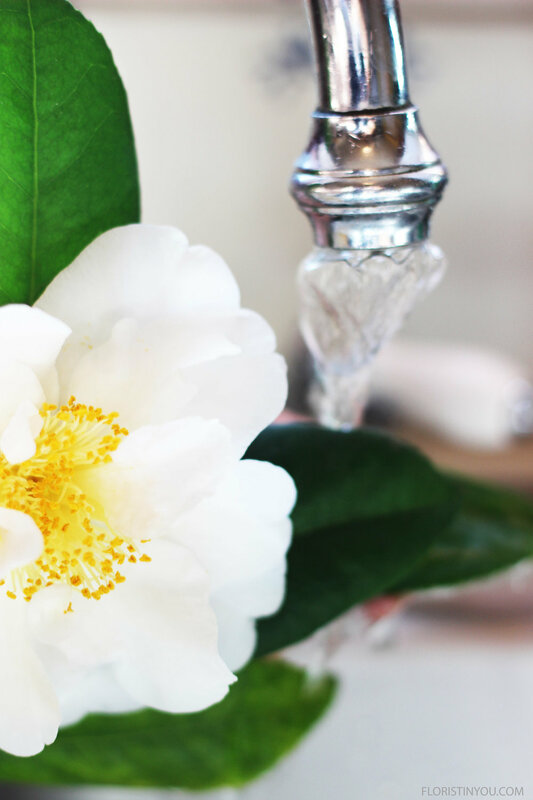 Camellia blossoms have almost a dream like quality to them. 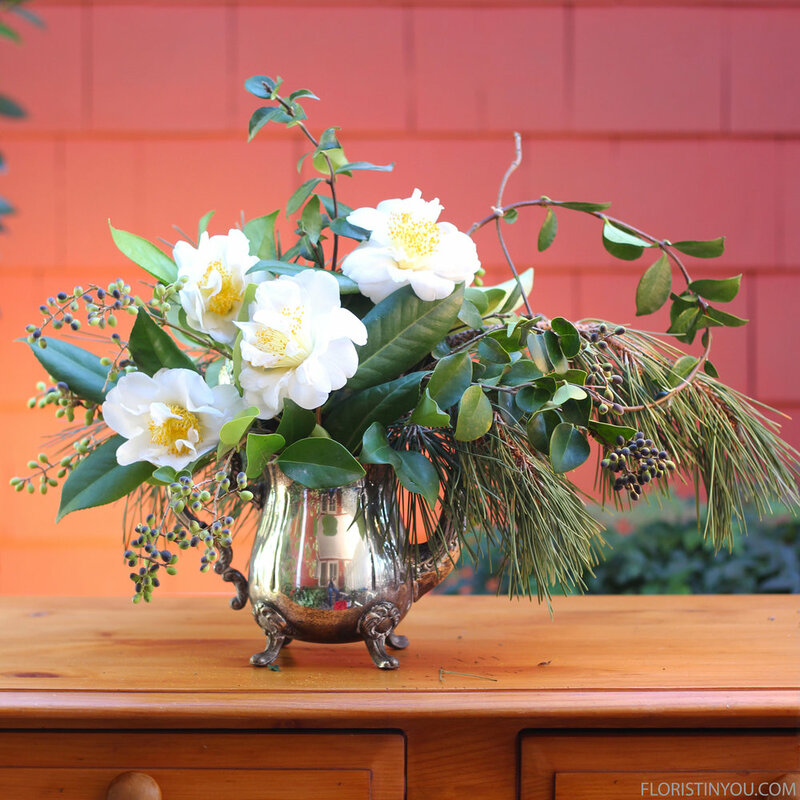 Add 1 Cone and 1 Camellia to the back. For the tiny tea pot, insert Pine and Jasmin. 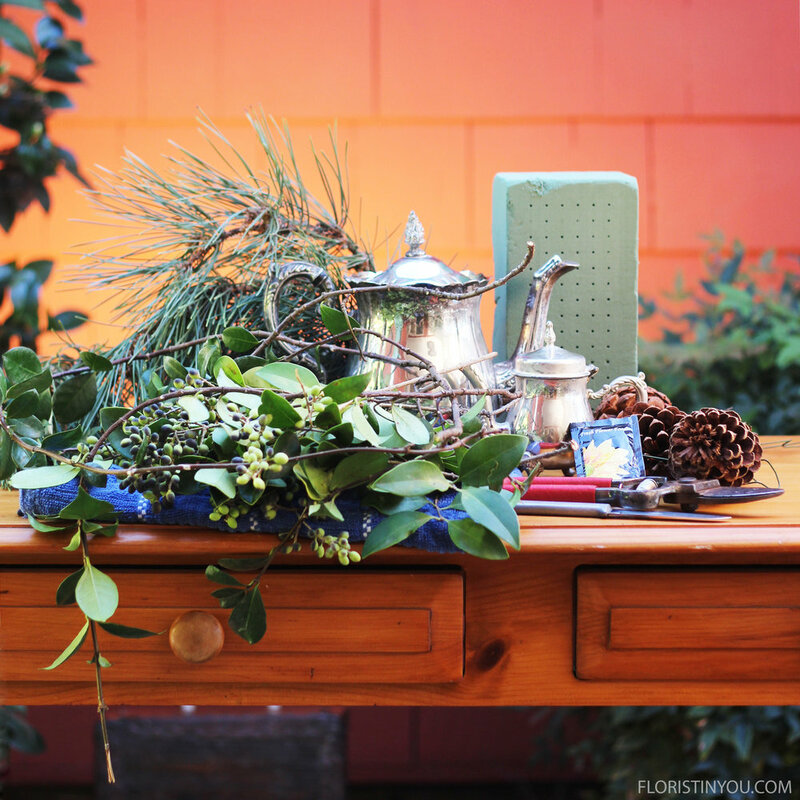 Add Privet Berry &1 Camellia bud. Here is your tea pot and your tiny tea pot.